Selectmen broach replacement for emergency manager Eerik Meisner. 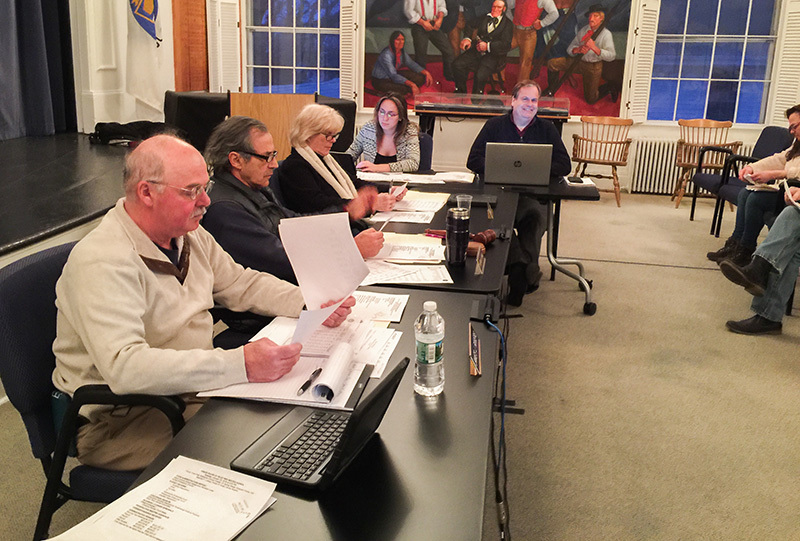 Tisbury selectmen agreed Tuesday night to assemble a short-term rental task force to gather information and advise the town about the state’s short-term rental tax that the town can begin collecting in July. Selectman Melinda Loberg, Fire Chief John Schilling, and realtor Elaine Miller were selected as the ad hoc core of the task force. Fred Rundlet, who co-runs the Look Inn, told the board he would like to be part of the task force, too. Israel said revenue, affordable housing, wastewater, registration and tracking, infrastructure, and “a major inspection component” are issues Tisbury needed to be well informed on with regard to the tax. Loberg spoke in favor of forming the task force, and said she hopes in one of the upcoming selectmen’s meetings, the board can formally launch the task force and empower it with a mission. Town administrator Jay Grande said it’s difficult to gauge what support staff the town may need to manage short-term rentals because what the tax will generate is hard to forecast. “We have no clear sense of what the revenue stream will be,” he said. The board closed the issue with the expectation they would revisit it in two weeks’ time. In other business, the board discussed finding a replacement for emergency management director Erik Meisner. Curiously, throughout the discourse, Meisner’s name was never mentioned. Meisner, a former Tisbury Police lieutenant, was demoted to an acting sergeant shortly after Chief Mark Saloio took over the police department, and then terminated from the department under circumstances neither the town of Tisbury nor Meisner have been willing to explain. “As to the emergency management director designation for the town, that position is technically open,” Grande said. Grande later told The Times Meisner occupied the position for about four years. At the meeting, Grande went on to say he intended to put forth some potential candidates after he confers with Police Chief Saloio and Chief Schilling. “There are prospective candidates that have already been spoken with, but I’m not going share the names,” he said. He told the board that harbormaster John Crocker, who is assistant emergency management director, is currently acting emergency management director, but ultimately somebody needed to be found to serve until June, when the position is up for reappointment. Crocker was not present at the meeting to comment. Israel suggested a new job description should be created. Tisbury Finance Director Jonathan Snyder later told The Times the emergency management director position has a stipend of $3,000 annually. Loberg said it was imperative an interim appointment be made as soon as possible. “I don’t want to wait until June,” she said. Never miss an opportunity to tax something and drive people further away from the goal you are trying to reach. Property taxes are already too high and are mostly paid by the people who dont have schoolchildren and who are not resident here for most of the year Meanwhile the administration never allocated depreciation funds for the Tisbury School. Hello. I am here from the government and I am here to help you. Loberg spoke in favor of forming the task force —- always a task force made a decision for GOD`s sake from your own homework. You got a laptop use it. As a Tisbury sick & tired tax payer I want to know what happened to emergency management director Erik Meisner! Is that stuff classified? Here we have another example of Island residents finding ways to make off island property owners and visitors pay more so they can pay less. Sounds like a great idea for you but has anyone ever considered how unfair and unkind this is for them. How would you feel if you had to pay 18% higher taxes on your property in Tisbury because you live off island, or higher fares on the ferry because you are not eligible for excursion rates, or pay higher prices for groceries and shopping because you are not allowed to buy an island card. Now you want add taxes their rentals. Think about it, off island property owners and visitors to your island are people just like you. They don’t deserve to be used in this way. Just because you can make these decisions without their input doesn’t make it right. It just makes you look greedy and uncaring. Like others have said on other occasions, you know, if you live here, that the cost to go out to eat is more, gas is more, cable is more, grocery stores are more, cost of living is more, hiring people to work on your house is more etc. It’s no surprises. So it’s also not a surprise that if you are a summer resident that you pay the higher tax rate, you pay more for the ferry (not always true btw) and the island card and banishment from getting a discount Cronig’s card is part of the off islander experience they know about. (why people that own cronigs are allowed to discriminate against people like that is beyond me). So these summer residents know all this yet they still buy, they still build, they still invest into our community because they love this community and place. They’re not being used (discriminated against at Cronig’s yes) but not being used. Some summer residents are very happy to invest in the community they summer in, it brings them joy to see friends, take walks along the beach or a nature trail , have a dinner out with them and enjoy it. Stop telling us that all summer people are being taken advantage by island year round residents because not all summer owners feel that way. The weekly rental tax passed by the state is a state law, the towns took advantage of years ago the added local tax and it would be irresponsible for the island towns not to investigate how to collect and utilize this windfall. BB Clearly there is a difference in the cost of living on MV for off island property owners and visitors. They pay more so island residents can pay less. Yes, thankfully they still keep coming and still keep paying the price because they love the island. And thankfully they bring a lot of vacation money that supports island businesses. However, I think if they were asked, not many would agree that they should have to pay a higher rate then island residents for food, ferry tickets and property taxes ( in Tisbury). They do it because they have no choice if they want to vacation or live part time on the Vineyard. Yes, taxing short term rentals is a State mandate but adding additional taxes for affordable housing, property tax relief, clean water or other island needs is decided by island residents in each town. Using it for property tax relief would be my choice. Hopefully any plan for property tax relief will include the off island property owners since that is where most of this money will be coming from. Unfortunately, I suspect that will also only be made available to year round residents much like the island card and excursion rates. I understand the need to investigate ways to collect and use what is a windfall for you, but keep in mind that is is just another rip off for your off island neighbors and the many summer guests that come to enjoy the Vineyard. I agree. To some degree. I agree that using it for tax relief is the only way it should be used and not a housing bank. I don’t agree that any plan for property tax relief should include off island property owners. The taxing of short term rentals was only a 5.7% state mandate. Other towns added the 6% on as a local option tax years ago and this bill automatically adopts that. They have plenty of say as a summer resident but no vote on how it’s spent or how it was passed at town meeting. The towns decided when the local option tax was passed at town meeting for both meals and lodging. Only a vote for this housing bank is needed. That would steal 3% of the towns 6% local option tax diverting it to a housing bank where your town has no real control. I’t s housing bank and can be used anywhere on the island for any initiative the housing bank people feel fit to use it for. They’re trying to use it for their pet housing projects. They’re trying to get this housing bank so they can reduce the cost of their already in the pipeline projects. It would be interesting to see how much money we’ve already spent on this island because I am really tired of hearing from housing advocates say that we don’t do enough to address the problem. Does any one know how much we’ve spent over the last 10 years through CPC funds in ALL the towns? Sure, let’s all feel bad for people that can afford a second (or third, or whatever) home on MV. BB I would say you are right, not all summer residents are unhappy with the way they are being treated. The ones with a silver spoon in their mouth haven’t noticed. Most of the hard working people that struggled to build or buy property here know they are being hosed.Even the year round people people know it hence the steady flow of Brown Trucks that arrive on the island each and every day. By the way the 20% only applies to Tisbury as they are the only town that gives a discount to year round residents. Not all are silver spoon summer people are silver spoon people . Many people who own summer homes out there are those that are in it with their families, share time in that house for a week here and there for the summer or go into the house with others to afford it. Many people want to be here and they make it work. A lot are hard working off island people, not all trust fund babies. Let’s face it, we have our own amount of trust fund babies on island that live here year round. what happened to the concept that you have some privacy in your home ? dondon12, we finally agree on something. That is gone, you’re correct. MV Al, I hear you, that’s why I was separating summer vs year round. That brown truck business has grown in the last 5 years alone. DonDonDon12 are you referring to the inspection squad that will be checking out all the rental units and checking all the rental Web Sites ?